I used Susan's Victorian Bliss for this layout. It is my entry into the 8 picture challenge on the Raspberry Road Designs forum. 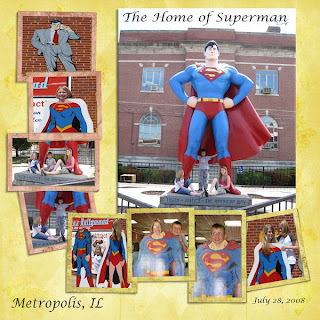 The bright yellow paper and the clustered frames were the perfect setting for pictures of Superman from my vacation trip. I love all that superman stuff, and the gigantic superman statue! Your layout is awesome! Looks like you're giving away some free quickpages on your blog. Thanks for your generosity!